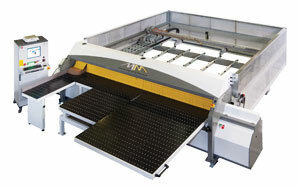 For over 40 years Macmazza have been producing beam saws and sizing centres either in a standard, special customised or as a complete turn key project. The basic mechanical and electronic components are common to all models whether it be the most semi automatic system or a fully automated system. Where Macmazza wins over others in this sector is in their ability to adapt products in a modular fashion as required and dictated by the industry. From their entry level model the TS75, or the Top Saw with its patented front roller system the build and design criteria is always the same, heavy duty, reliable and flexible technology which customers require within their demanding day to day production schedules. With our knowledge of cutting and sizing NEY and Macmazza can offer the right solution for your particular application. The beauty of Macmazza is not only the strength of the build quality and clever innovations but in the comprehensive optimisation and software package incorporated as standard in every machine. At last no expensive optional extras are required just to use the machine to its full potential. 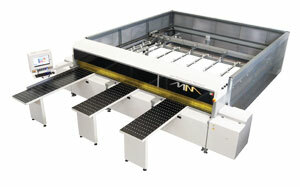 All machines include programming in the office or on the machine, 5 levels of cut with NO LIMIT to numbers or size. Managing the stock of panels as well as the recycling of offcuts is also included as well as edging detail, grain direction and label printing. Statistics of daily production and maintenance programs/ videos complete the package.